Out of Sight, Out of Mind | Tennessee Aircraft Services, Inc. In aircraft ownership and maintenance there are some things that just don’t seem to get our attention even though they’re right in front of us, literally. The control column attaches to the yoke in plain view during the entire flight, but we seldom consider its condition. The pilot side has a special collar with a small hole for engaging a control lock. What you probably don’t think about is what is happening on the front side of the instrument panel. (front being the forward side, not the aft side which you see during flight). What we don’t know can hurt us. The control column is actually a hollow aluminum tube with the control yoke at one end and attached to the flight control mechanism forward of the instrument panel at the other end. The tube transfers pilot input at the yoke in the form of torque (roll input), tension (pitch up) and compression (pitch down). The forces aren’t major but are very important, obviously. 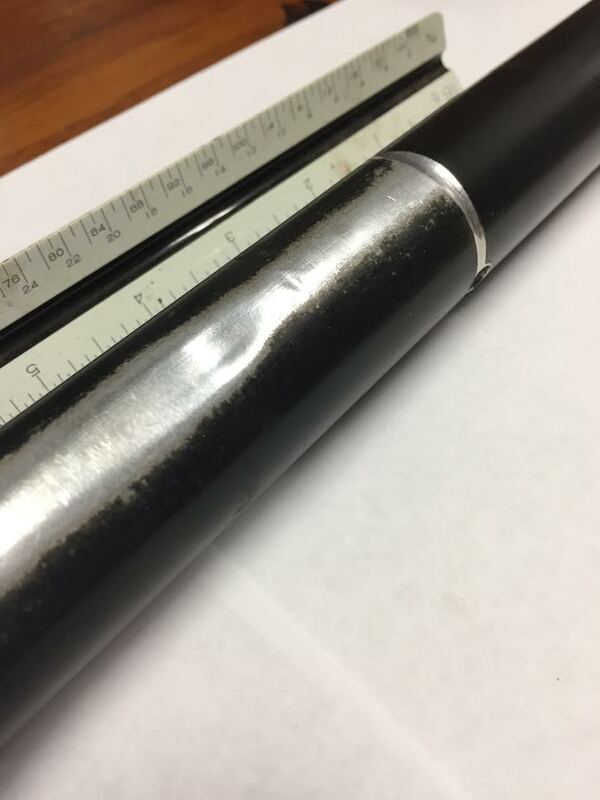 The 150/152/170/172 series have a pretty small diameter tube, while the 200 series planes are much larger at about 1.25 inch outside diameter with wall thickness of only 0.040 inch (40 thousandths of an inch). There are several different types of designs for passing the control column through the instrument panel. Most of the Cessna single engine fleet have some version of a slide bushing, which requires minimal maintenance in the form of a dry lubricant. The later model 206, 207 and 210 series have a very different arrangement, requiring more attention and possibly more money. That’s what we need to talk about today. The 206 series s/n U20601701 (1972) and on, the 207 series s/n 20700268 (1975) and on, and the 210 series s/n 21059200 (1970) and on use three roller bearings mounted on adjustable cams located on the forward side of the panel. These roller bearings are Cessna part number p/n S2010-3 and look like a miniature wheel with a nylon type material wrapped around it like a tire. The function of these bearing assemblies is to keep the column centered in the hole through the panel and allow smooth operation at the same time. A healthy set of bearings will give almost no side to side or up and down free play in the yoke. The service manuals list no guidance on control column free play limits. Instead, it is left to the owner/operator or mechanic to determine how much movement is excessive. Certainly, if the column is making any contact with the panel, it would be cause to attack with tools. The usual first failure mode is that the nylon covering deteriorates and falls off the bearing. This creates a gap between the column tube and what remains of the roller bearing assembly. An attentive operator would note this as excessive lateral or vertical movement of the yoke. As the other bearing assemblies fail, the column eventually begins to rub where it passes through the instrument panel. This might be detected by the light scraping sound. Eventually, the black anodized finish of the yoke is worn through, exposing the bright silvery color of the aluminum. The bearings are mounted on eccentrics, or cams, so they can be adjusted to hold the column properly centered in the instrument panel hole. When unwanted movement of the column is first detected, the typical correction is to adjust these cams. With just one or two bearings damaged, an adjustment may reduce column movement to an acceptable amount. Three damaged bearing are too much for usable adjustment. 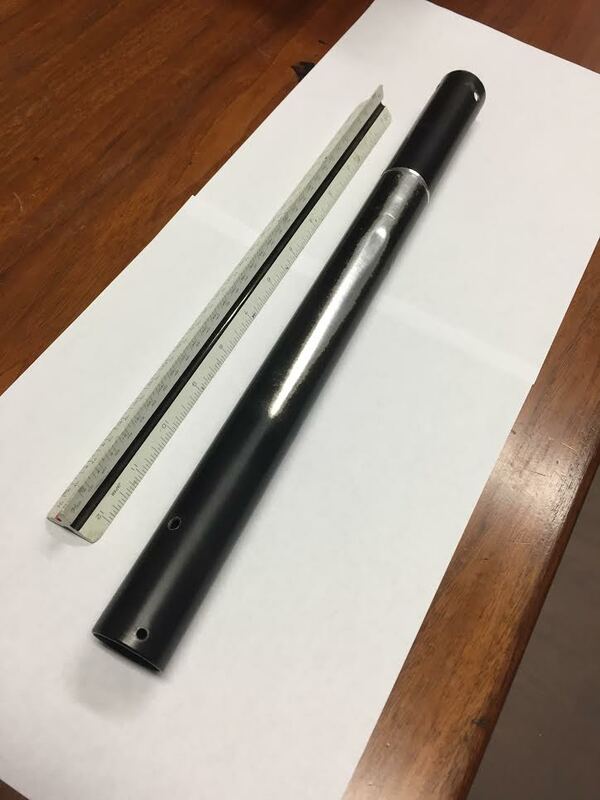 Regardless of adjustment results, the steel part of the bearings are now in direct contact with the aluminum column tube, and the damage begins. These bearings are very robust, nylon wrapping aside, as judged by their typical longevity. When they do finally fail it is pretty catastrophic. Worst case is a lower mounted bearing totally comes apart. This doesn’t happen often, but it is a known issue in the fleet. Even this catastrophic failure may not be noticed by an uneducated pilot. Regardless of the failure mode of the bearings, the control column still does its job, and no one gets hurt. There’s no pain unless the problem is ignored or goes undetected. With bearings damaged or out of adjustment, the column can rub on the instrument panel with the inevitable loss of material. Most of this rubbing occurs on the lower surface of the tube and therefore not in the normal view of the pilot. The full view of a column showing where the underside rubbed against the instrument panel. A little rubbing may not seem like a significant concern, but it doesn’t take much to cut through forty-thousandths of an inch of aluminum. If you’ve read much of my work, you’re aware of the rule of thumb for maximum loss of structural material. Unless otherwise allowed in an airplane’s structural repair manual, the maximum allowable thickness reduction of a part is ten percent. That means rubbing just four thousandths of an inch of aluminum from the tube renders it unairworthy. In case you don’t think in terms of thousandths of an inch, just know that a common sheet of printer paper is 0.0035 inch (three and one-half thousandths). That’s a short distance from airworthy to junk. One would think tubes from all the Cessna models would be the same and easily interchangeable. In fact, there are many iterations of this tube depending on the model and year of the plane. They come in different lengths with different attachment ends and various hole patterns. Add to this complication that we’re discussing legacy airplanes where Cessna’s financial incentive to keep every unique part number on the shelf is small. A closer view of the damage which was about half the thickness of the tube. The groove cut around the control lock hole location was about the same depth. Our first confrontation with a worn column tube was on a friend’s 1970 T210K. Our research revealed the tube part number for this plane was only used on an aircraft serial number group of only 250 units. Of course, the part was not in stock at Cessna, or anyplace else in the free world that we could find. Cessna also reported they wouldn’t be supplying the part as this one was considered no longer available. The short version is that the owner had to jump through many hoops to fabricate an owner-produced part and at significant expense. We encountered the same problem on a new to us customer’s plane a few months ago. This time the plane was a bit newer, and Cessna had the correct part number unit on the shelf. Of course the list price was north of $3,500.00. It hurt financially, but at least it was obtainable. The labor to replace these tubes is another expense. The right side can take three to four hours, and the left runs six to eight hours. This doesn’t include repairs for any collateral damage incurred due to disturbing surrounding systems in the repair process. Replacement of the copilot side column is often less trouble than the pilot’s side because the right instrument panel is smaller with fewer components to get out of the way. The original analog gauges, attached wires and tubes, are all just as as old as the plane and very susceptible to damage when moved about. The worst part is that peripheral problems won’t likely be discovered until everything is put back together and tested. The pilot side, though, is usually the true nightmare. All the flight instruments must be removed. Not only will that mess with old wiring, but those really brittle pneumatic hoses to the gyros will be disturbed. We’re talking forty year old rubber that’s hard as a rock and dry rotted. Just slightly flexing these hoses can break off small internal flakes. These rubber flakes will patiently wait for that first engine start when the pneumatic pump sends a rush of air flow pushing the debris straight to the unsuspecting gyros. Even in the best of planes, opening up the instrument panels to adjust and replace these little bearings comes at high risk for collateral damage. Like any surgery, it should be avoided unless truly needed, and saving damage to the control column tubes is a worthy cause. If it eases the pain, consider those forty year old rubber hoses are fully depreciated by now and deserve to be replaced as well. 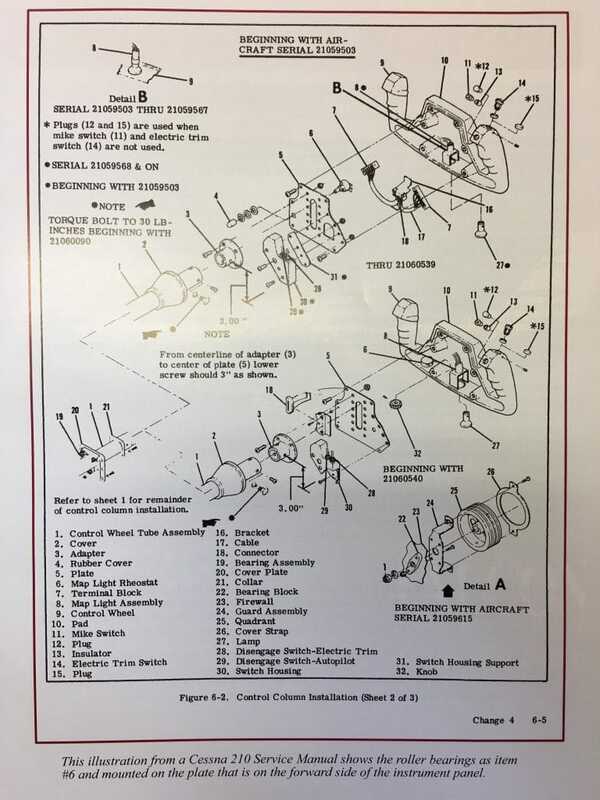 Prior avionics upgrade work can create an interesting twist on the labor effort to make adjustments or repairs to the control column bearings. A single primary engine monitor installed to replace the old steam gauges can reduce collateral damage issues and cut the expected labors hours to access the right panel bearings. Previous installation of a Garmin G500 can make access to the pilot side an absolute breeze by comparison to the original instruments. I’m just saying this could help you feel better about the cost of that huge panel upgrade you felt compelled to do a year or so ago. The hope is that everyone would take an extra fifteen seconds during their next preflight to check the condition of the control column tube and the rollers. This would include pulling the control yoke all the way aft to expose the maximum portion of the tube. Look for any signs of rubbing or wear that is apparent to the touch. Then attempt to move the column up, down, left and right. Also note if any light scraping action can be detected as the control is moved fore and aft. If no problems are noted now, congratulate yourself on saving several thousand dollars as well as making another successful step to mitigate the extinction of the legacy airplane species. If something is noted, contact your mechanic very soon for a more quantified evaluation. There may still be hope if the tube hasn’t worn past the ten percent limit. Correcting the bearing failure or alignment issues immediately stops further wear. Not that this is a new problem in the fleet, but it is one of the several lesser known issues. Every few years generates a new batch of aircraft owners as well as maintenance providers. Many new owners and mechanics aren’t as old as the airplanes, so there’s always old information to be relearned. The industry is beginning to come to terms with the concept that each owner is merely a temporary steward of these wonderful airplanes. That spirit implies a responsibility on these stewards to pay attention to the many simple inexpensive precautions that can preserve these valuable machines for future enthusiastic stewards.